The cursor flashes on the monitor. In the background the computer softly hums, like traffic noise at a great distance. My fingers tap the cool, solid uniformity of the plastic keyboard, shaping words into sentences. This foolish act of creation is suspended when I grasp the mug of coffee. Before sipping, I inhale the aroma of Peet’s French roast. Ahhh…the heady scent of a fresh brew. Next, the taste. Brash and bitter, but tempered because—an indulgence—I added a dash of half-and-half. I have my early morning commitment: writing. On most days, I’m settled in my office chair by 4:00am, bright-eyed and bushy-bearded, ready to tackle a first draft or revise the 10th (100th?) draft of a story. Peet’s coffee is my literary communion and companion. I can’t explain why I relish their French roast while scorning Columbian or Sumatra beans. I drink from special coffee mugs (the one in the photo is used only when I’m at work on my endlessly revised novel “Ordinary Time”). My desk has a leather coaster from Yosemite’s glorious Ahwahnee Hotel, a decades-old gift from friends. A photo of my wife is nearby, glancing back toward the camera, snapped during our honeymoon. A beehive-shaped kiln-fired pot holds pens and pencils. Grace, then approaching ninety and a member of Wisconsin’s Blanchardville United Methodist Church, presented the sturdy container to me while I was her pastor. She died a year or so later. I keep nail clippers in a ceramic dish, always close, because as a kid I acquired the nasty habit of chewing nails. Isn’t it awful how some habits haunt you even after so-called maturity? But if the clippers are close, I’ll reach for them to trim my nails instead of random, destructive nibbling. Sad, eh? Rituals, habits, self-doubt, persistence and procrastination define me. Tokens, mementos, tools and photos create the nest where I write. I am vividly aware, in the dark silence of a predawn morning, where it seems “nothing” is going on, that my peculiar little world includes and invites every sense I possess . . .
And because during these early hours I include time for prayer to a Creator I cannot “see” and for creating stories out of “thin air,” maybe I also welcome a sixth sense. So let’s say six senses. All operating. All present. And yet on some mornings I am “blind” to every precious thing and person, every memory and goal. How can that be? I read about a fellow in the Bible named Bartimaeus. He’s blind. But he’s certainly not dumb . . . Bartimaeus can create sound with the best of them. And so, when the sightless beggar hears the crowd clamor about Jesus, the prophet from Nazareth, he shouts . . .
Preach it, read it, interpret it in all the ways you wish: about a grumbling crowd, a squeaky wheel, courage and miracle. Is it metaphorical? Literal? All views are true enough! Oh if I ever lose my hands, Oh if . . . I won’t have to work no more. Yes if I ever lose my eyes, Oh if . . . I won’t have to cry no more. I wonder, as I read about blind Bartimaeus longing for sight or listen to blunt, hopeful lyrics about transforming obstacles into opportunities, how much time, in my waking hours, do I ignore the world around me? What don’t I see, taste, smell, hear and feel? Why is it difficult to truly pay attention to what a friend says? How come the people I love the most are the ones taken for granted? Every day dawns a miracle. Help me—with all five or six or more or less senses—to be here! *And perhaps no one who reads this will connect to or relate with Stevens’ “ancient” music. But many of his songs, and certainly this one, formed a joyful, insightful soundtrack for my teens and twenties. And nowadays, whenever I listen, I am still touched by Stevens’ creativity…. Very thought provoking. I do so enjoy how you look at life differently abled by the work that you do. Moonshadow and Cat Stevens are some of my favorite music. Dates me I guess. Thank you very much for your insight into the blind fit into the crowd. Since I’m in a wheelchair and have been for several years, I think of many things for a differently abled perspective. We are not disabled, we do things differently. Wheels don’t stop me from doing most things, and I tend to the ol’ Bartimaeus was no different than I. You do make me think out of my comfort zone almost every week. And for that I am grateful. Hi Larry, I don’t know why I haven’t found your blog before, but did now through Text This Week. I’m a colleague in the same Annual Conference! You totally got me with your Peet’s French Roast and special mugs. I am right there with you. Good stuff, that Peet’s French Roast. Nectar of the Gods, I think, or at least a jump start on the morning. Thanks for your thoughtful ponderings on Bartimeaus as I wonder how to approach the sermon this week. See you at Annual Conference somewhere in the crowd. But now you’ve found it! Hey, Linda, thanks for you comments. 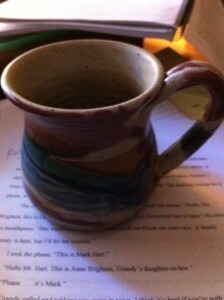 If anything I write helps with a sermon, well that’s almost as nice a hot mug of Peet’s! It’s been a few years since I’ve roamed around Annual Conference . . . 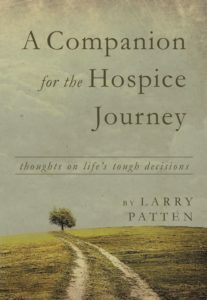 I mostly keep busy with my hospice work. Take care! !